Support the Music Makers of Tomorrow with a Donation Today! At the milestone of its 15th anniversary, The Latin Recording Academy, dedicated to improving the quality of life and the cultural condition for Latin music and its makers both inside and outside the United States, established a charitable foundation called the Latin GRAMMY Cultural Foundation (LGCF). Respected leaders of The Latin Recording Academy have stepped forward to oversee and initially fund and guide the Foundation’s creation. Of note has been the return of The Latin Recording Academy’s first independent Chairman, Manolo Diaz, who has been appointed Foundation’s Vice President with executive responsibilities. 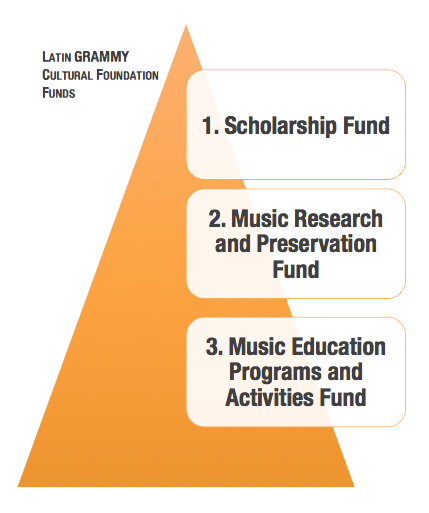 Also important to note is The Latin Recording Academy’s commitment to subsidize the LGCF basic administration needs during its initial years. The Latin GRAMMY Cultural Foundation, through scholarships, fellowships, grants and education programs, furthers international awareness and appreciation of the significant contributions of Latin music and its makers to the world's culture. 1. The Foundation’s primary charitable focus will be providing scholarships to gifted music students interested in Latin music genres, with financial limitations, preferably between 17 and 24 years of age and from around the globe, to perfect the knowledge and interpretation of Latin music. 2. The secondary focus is to provide fellowships and grants to individuals, scholars, organizations, and institutions worldwide for the research and preservation of Latin music genres. 3. The Foundation’s third focus is to produce Latin music education programs, tributes, activities, and events, including the Latin GRAMMY in the Schools program, implemented by LARAS since the year 2000. 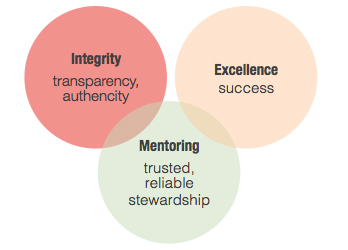 The LGCF will honor, abide by, and continually strive to be internationally known in all its offerings for these core values and guiding principles. 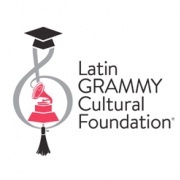 Scholarship awards of the Latin GRAMMY Cultural Foundation will be offered through a three-tiered program of support to exceptional music students interested in studying Latin music genres. Applicants should preferably be between the ages of 17 and 24 and must have financial limitations that prevent them from studying a full time four-year bachelor’s degree in a prestigious music college or university Students applying must be previously admitted to study at the music institution or university of their selection and must complete the Foundation’s application process. Scholarship selection and award making processes will be guided by rigorous policies developed by the Foundation. Payments of all scholarship awards will be allocated by the Foundation directly to each music institution on behalf of the scholarship recipient. Awarded students will become Goodwill Promoters of the Foundation and will be joining in promoting its mission, service to communities, and furthering its good works. The Prodigy Scholarship will be offered to one (1) exceptional student that has been previously admitted to Berklee College of Music in Boston to study a four-year bachelor’s degree full time, is interested in Latin music but has severe financial limitations to pursue his studies. Typically, this scholarship will be co-financed by a very prominent Latin artists and the scholarship will bear his/her name. The recipient will receive an award of up to US $200,000 towards a four-year bachelor’s degree in music of full time study. The scholarship recipient must maintain a cumulative grade point average of 3.50 each semester and must comply with the Student Scholarship Terms and Conditions Contract of the Foundation listed in the Scholarship Guidelines. The Gifted Tuition Scholarships will support three (3) talented music students, with an interest in Latin music, requiring financial assistance and admitted to a music institution or university to start a four-year bachelor’s degree of full time study. Those who demonstrate the most talent, perseverance and determination will be selected from a competitive pool of international students. The three (3) selected students will receive an award of up to US $100,000 that will cover four years of full time study towards a bachelor’s degree in the music institution or university of their choice. This award will cover tuition costs only. The scholarship recipients must maintain a cumulative grade point average of 3.50 each semester and must comply with the Student Scholarship Terms and Conditions Contract of the Foundation listed in the Scholarship Guidelines. The Tuition Assistance Scholarships will be awarded to forty (40) aspiring talented music students, with interest in Latin music and with financial limitations to pursue or start a four-year bachelor’s degree in music. The music institution or university in which the student is enrolled, will receive up to US $10,000 towards his/her bachelor’s degree. This is a one-time award that will cover totally or partially the tuition amount not covered by other scholarships. This award will only be valid for one year of study and will cover tuition costs only. The selected students must maintain a minimum cumulative grade point average of 3.00 each semester and must comply with the Student Scholarship Terms and Conditions Contract of the Foundation listed in the Scholarship Guidelines. The Preservation and Research Grant Program of the LGCF awards four (4) grants a year of up to $5,000 each to projects presented by organizations and individuals in an effort to further international awareness and appreciation of the significant contributions of Latin music and its makers to the world’s culture. We encourage projects from around the world that advance the archiving, research and preservation of Latin music genres from the following twenty-four countries: Argentina, Bolivia, Brazil, Canada, Chile, Colombia, Costa Rica, Cuba, Dominican Republic, Ecuador, El Salvador, Guatemala, Honduras, Mexico, Nicaragua, Panama, Paraguay, Peru, Portugal, Puerto Rico, Spain, the United States, Uruguay and Venezuela. Award selection will be made through a competitive process guided by a Committee of experts according to the Foundation’s policies. Each year, the Latin GRAMMY Cultural Foundation® performs several educational programs, such as the Latin GRAMMY® in the Schools, Latin GRAMMY® Master Series and Latin GRAMMY® Soundchecks. The Latin GRAMMY® is the Schools is an event where artists, music professionals, or sound engineers visit middle schools, high schools, colleges or other music institutions, and are interviewed by a moderator in front of a group of selected students, provoking the guests to tell stories, examples and anecdotes that emphasize the efforts and perseverance needed to overcome the obstacles and barriers of music careers, and the need of optimizing education opportunities to enter the work market with a strong preparation and advantage. This event may include a music instrument donation to music schools in need. In past years the Foundation hosted educational events in schools and music institutions in Argentina, Colombia, Chile, España, United States, Mexico, Panama, Peru and Puerto Rico. With artists like Ángel Cucco Peña, Calle 13, Carlos Vives, Chino y Nacho, Claudia Montero, David Bisbal, Dayanara Torres, Diego Torres, Diana Navarro, Fonseca, Gente De Zona, Gilberto Santa Rosa, iLe, Jesse & Joy, Juanes, Leslie Grace, Luis Coronel, Luis Fonsi, Marilina Bertoldi, Maitena Aboitiz, Miguel Bosé, Natalia Lafourcade, Pedro Capó, Poncho Lizárraga, Prince Royce, Ricky Martin, Tommy Torres, Wisin, among others. Welcome to the Latin GRAMMY Cultural Foundation applications section! Below you will find all the information you need to apply for our grant and scholarship opportunities. THE 2019 GRANT APPLICATION PROCESS WILL BE OPEN FROM SEPTEMBER 14TH TO NOVEMBER 20TH, 2018! The LGCF awards grants for up to US $5,000 to projects presented by scholars, cultural institutions and nonprofit organizations worldwide for the research and preservation of Latin music genres. Promoting results of scholarly research, and documenting and preserving information about Latin music genres should be the main focus of the projects. To review the guidelines and apply for a grant with the LGCF please click on the links below. The application process will start on September 14th, 2018. All applications are due November 20th, 2018, 11:59 p.m. EST. Applications that are late, incomplete or not within the guidelines, will not be reviewed. The award selection will be made through a competitive process guided by experts of the Grant Committee of the LGCF, according to Foundation policies. All Applicants will be notified by email the week of January 21st, 2019 with the results. Winners will be announced on January 23rd, 2019 on this page. Good luck to all applicants! The 2019 Grant application process is closed. The 2020 Grant application process will be open on September 2020. THE 2019 GIFTED TUITION SCHOLARSHIP AND TUITION ASSISTANCE SCHOLARSHIP APPLICATION PROCESS WILL BE OPEN FROM DECEMBER 6TH 2018 TO APRIL 10TH 2019! THE 2019 EMILIO AND GLORIA ESTEFAN SCHOLARSHIP APPLICATION WILL BE OPEN FROM DECEMBER 14TH 2018 TO APRIL 10TH 2019! The LGCF scholarship awards are offered to very gifted music students previously admitted to the college or university of their preference, interested in Latin music genres, preferably between 17 and 24 years old and with severe financial needs, to study a four-year bachelor’s degree in music. Selected applicants will receive tuition assistance through a three-tiered program of support. Students interested in applying to the Emilio and Gloria Estefan Scholarship, must be previously admitted to Berklee College of Music to the Fall 2019 semester. All applicants must upload their acceptance letter to the LGCF Scholarship Application. • The Emilio and Gloria Estefan Scholarship will be awarded to (1) one student who is exceptionally gifted, is interested in Latin music and needs financial assistance to start his/her education at Berklee College of Music. The four-year scholarship, which holds a maximum value of $200,000 USD, will be awarded towards a bachelor's degree in music. Students interested in applying for the Gifted Tuition Scholarships and Tuition Assistance Scholarships must be previously admitted to a four-year bachelor’s degree program in music at the college or university of their choice. All applicants must upload their acceptance letter to the LGCF Scholarship Application. • Three Gifted Tuition Scholarships of $25,000 annually for four years, for a maximum of $100,000, will be awarded for full time study of a four-year bachelor’s degree in music starting their studies in Fall 2019. This award will cover tuition costs only. • 40 Tuition Assistance Scholarships will be awarded to students pursuing or starting a four-year bachelor’s degree in Fall 2019 with a maximum allotment of $10,000 each for tuition costs only. This is a one-time award that will cover totally or partially the tuition amount not covered by other scholarships. This award will only cover tuitions costs and will only be valid for one year of study for the following semesters: Fall 2019 and Spring 2020. The 2019 Scholarship application process is closed. The 2020 Scholarship application process will be open in January 2020. Please review the Scholarship Award Guidelines below before completing your LGCF Scholarship Application. Scholarship selection and awards process will be guided by the Scholarship Committee of the LGCF, under rigorous policies developed by the Foundation. The scholarship recipients will become Goodwill Promoters of the Foundation, joining in promoting its mission, service to communities, and furthering its good works. Deadline to apply is April 10th, 2019 at 11:59pm ET. The Emilio and Gloria Estefan Scholarship winner will be contacted on April 29th, 2019. Applicants of the Gifted Tuition Scholarship and Tuition Assistance Scholarship will be contacted during the first two weeks of July 2019 with the results. Good luck to all applicants! Luis Cobos, Chairperson of the Board of Directors; Neil Portnow, Vice Chairperson of the Board of Directors; Raul Vazquez, Treasurer/Secretary of the Board of Directors; Gabriel Abaroa, Foundation President and Member of the Board of Directors; and Mireya Blavia de Cisneros, Member of the Board of Directors. General donations are used where it is needed most!